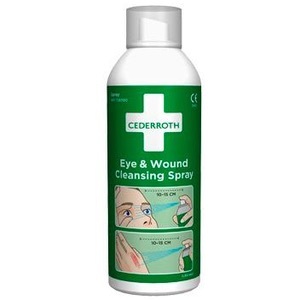 Rinsing and cleansing out dust and dirt from eyes and wounds. Provides a soft flow of liquid, with a total rinsing time of 5 minutes. Can be used multiple times and remains sterile to the last drop. Fits in the First Aid Station. Spray for rinsing and cleansing out dust and dirt from eyes and wounds. The spray provides a soft flow of water, with a total rinsing time of 5 minutes. This makes it practical for rinsing abrasions that need to be thoroughly cleansed, for example. The spray can be used several times and remains sterile to the very last drop. The bottle has been designed so that it can be used in any direction – for example, you can use it if you hold it upright or if you turn it upside down. The transparent capsule comes with a seal which breaks when it is opened for the first time. The bottle can be stored both vertically and horizontally. The liquid in the spray bottle is stored in an inner pouch, isolating it from the propellant and preventing the two substances from mixing together. Cleanse the nozzle before use by briefly spraying in the air. Spray at a distance of 10-15 cm from the eye or wound. Avoid direct contact with the nozzle. Pressurised bottle that may not be exposed to temperatures exceeding 50°C. May not be punctured or burned, even after the content has been used. Store at a temperature of between 0°C and +40°C. Contains 150 ml sterile sodium chloride solution, 0.9% NaCl. Without preservatives. Eco-friendly propellant: nitrogen. Total rinsing time of 5 minutes. Shelf life is 5 years from the date of production.